July is the start of the really hot season in Park City. While some of us long for this time of year all year long, others can’t handle the heat as easily. During the heat of the day, be sure to drink lots of water and cover yourself from the sun (check out our favorite sun protection gear for fly fishing). Also, if you are visiting Park City from afar, you may be surprised to see how quickly it can cool off from 90 degrees at 3:00 p.m. to the 50’s after the sun sets. For a splashy good time head on over to the Fieldhouse’s Splash Pad. Fun for the whole family, it might be the coolest free activity around. The splash pad is open every day from 11am to 7pm. Be sure to bring your own towel and sunscreen. 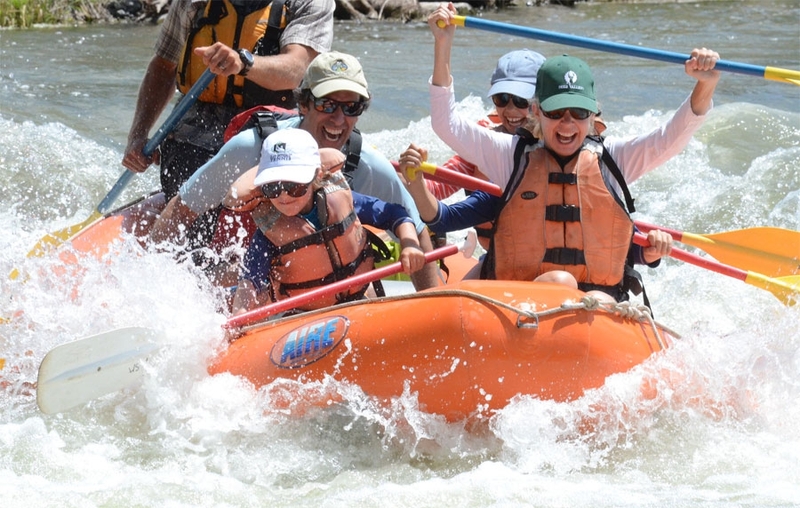 A Park City rafting trip is the perfect way to cool down and have an adventure with your family and friends. A guided whitewater package will include equipment, a well-trained guide and even a delicious lunch. Get ready to take in some amazing scenery, wildlife viewing and maybe a water fight. If you like to cool down in a unique and extreme way, check out the slip and slide on the water ski jumps at the Utah Olympic Park. Ride down the same jumps where the pros practice their ski jumps on a slip and slide and soar into a pool of giant bubbles! What is cooler than that? Please see the Utah Olympic Legacy website for dates and availability. If you like to cool off at a slower speed, a local pool is a great option to beat the heat. The PC Marc and the Silver Mountain gym have pools that are open to the public. There is also a new lap pool at Basin Recreation’s Fieldhouse. Summer evenings in Park City mean concerts! Many shows are free to the public and happen a few times each week. Sit in the shadow of a mountain and listen to live music. What more could you ask for? Check out Mountain Town Music for performances and venues. Just a few miles out of town is a State Park with a picturesque reservoir that offers fishing, boating, paddle boarding and more. Visitors can enjoy shaded picnic tables and an inviting beach area. Rentals and concessions are available during select days and hours. If you prefer the cool of indoors over the out, a nice place is the Mine Bouldering Gym. There are plenty of routes to keep you busy for an afternoon. Similarly, just around the corner, the Swaner Eco Center has a fun climbing wall. Check out the latest exhibit and get a work-out in all in one stop. Let a guide take you out for a day of fishing the river. You will learn a lot about the area, habitats and more. Trips include an expert guide, all equipment, snacks, beverages and round-trip transportation. All you need to do is show up ready for cool fun. Hop into a hot air balloon at sunrise for the coolest glimpse of town. No view is better than that from a balloon and you will have the photos to prove it. Each outing includes info on ballooning, and a celebratory post-flight toast. For those who cool treats, check out our local ice cream shop, Java Cow. “Cows” offers house made ice cream, sundaes, shakes, smoothies and more at this local institution. One Saturday afternoons there this live music across the street in Miner’s Plaza. It’s a win/win for the music and ice cream aficionado. There’s also a newer location in Kimball Junction called “Got Moo”. We hope you find a great way to beat the heat this summer with these cool Park City activities. Before we know it, snow will be flying again. So let’s enjoy the heat and summer activities while we can!